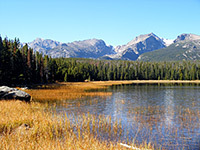 Two thirds of Colorado is mountainous; the famous Rocky Mountains run north-south through the middle of the state and contain 56 peaks exceeding 14,000 feet, but much of the far west of the state is also hilly. A large proportion of the center and the west is protected in national parks, monuments and forests, plus other public lands, and so offers many possibilities for exploration. The population density of Colorado is low, and is concentrated in the Denver-Boulder area at the edge of the Rockies - to the east begins seemingly endless flat farmland with only scattered habitation, which stretches across Nebraska and Kansas. Most of the southwest of the state is part of the Colorado Plateau - a large uplifted area of differently colored layered rocks that extends into New Mexico, Arizona and Utah. This plateau is approximately centered around Four Corners, which is the only point in the US where four states meet, and sits in the middle of a high desert area comprising barren plains interrupted only by low mesas and occasional lava plugs from extinct volcanoes. The Ute Indians occupy a large area of extreme southwest Colorado, while evidence of much older civilizations can be seen in several historic sites including Hovenweep National Monument, and most spectacularly in Mesa Verde National Park. North of here, the land begins to rise sharply towards the San Juan Mountains - a large area of rocky wilderness with several former gold and silver mining towns with a colorful history such as Silverton, Durango and Telluride, and including the spectacular Black Canyon of the Gunnison National Park, where the Gunnison River cuts an amazingly steep canyon through black metamorphic rocks on its way to joining the Colorado river at Grand Junction. This area is generally less well-known than the more mountainous regions further north, which receive many more visitors, principally to Denver and Rocky Mountain National Park, and Colorado Springs (whose attractions include Pikes Peak and Garden of the Gods). 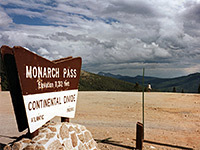 The continental divide passes through the San Juan range, and the few roads crossing the peaks must reach high elevations such as US 59 which peaks at 11,312 feet at Monarch Pass. East of the San Juan mountains the terrain gradually becomes less steep and is interrupted by the long flat San Luis valley, the location of the Great Sand Dunes National Monument. Further east, it is only a short distance before the hills stop completely and the Great Plains begin, stretching for over a thousand miles. The biggest town in west Colorado is Grand Junction, which is surrounded in most directions by colorful eroded cliffs reminiscent of the landscape found in nearby Utah - the Colorado National Monument protects one of the most spectacular regions. The Rocky Mountains extend westwards for 150 miles and include more old mining communities and modern day ski resorts amongst the many peaks and valleys, such as Vail, Aspen, Breckenridge and Crested Butte. The northwest of the state is the least populous region, and is covered by long, shallow valleys separated by steep-sided mesas. The most interesting site hereabouts is Dinosaur National Monument, extending across the border into Utah.